The number of Hispanics of Puerto Rican origin living in Florida has surpassed 1 million for the first time, according to a new Pew Research Center analysis of Census Bureau data, more than doubling the state’s Puerto Rican population over the past 14 years. The analysis of 2014 data, the most recent available, finds that the number of Puerto Ricans in Florida has increased 110% since 2000, when their population was 479,000. This outpaces the state’s total population growth rate (24%), as well as that of Hispanics overall (78%) during this period. The trend comes as the island’s economic recession has led many residents of the U.S. territory to look for opportunities on the U.S. mainland, and as more Puerto Ricans move to Florida from other states. The population shift also marks an important change in where Puerto Ricans choose to live. New York has long had the nation’s biggest Puerto Rican population on the mainland. 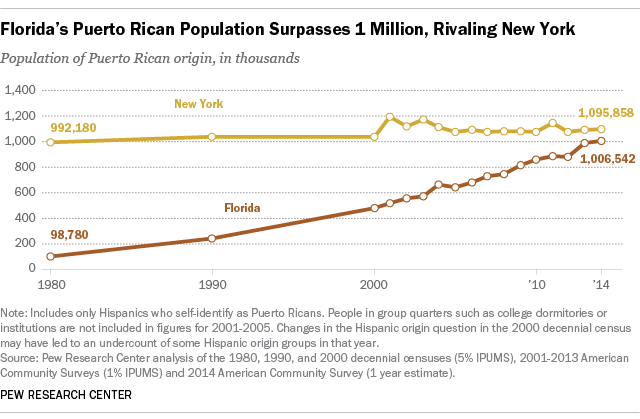 However, Florida’s population of Puerto Ricans has quickly risen since 2000, while the group’s population in the Empire State has stayed relatively flat. What’s more, from 2005, a year before the island’s recession began, to 2013, New York saw a net loss of Puerto Ricans to other states that was larger than Florida’s corresponding net gain. As a result, about as many Puerto Ricans live in Florida today as in New York. These changes could help shape the outcome of the 2016 presidential election. Florida is again expected to be a battleground state, and its growing Hispanic population could be more important than ever in determining which candidate wins the state. Puerto Ricans have primarily settled in Florida’s largest metro areas, with Orlando leading the way. In 2013, the Orlando-Kissimmee-Sanford metro region had the highest number of Puerto Ricans in the state, at 314,000. That figure was up by 41,000 (15%) over the previous year, the largest increase by number of any Florida metro area. But even Florida’s smaller metro areas are seeing a significant influx of Puerto Ricans. The Port St. Lucie area saw its Puerto Rican population surge 64% (7,500 residents) in 2013 over the previous year, among the largest percentage increases in the state. Other demographic changes are also underway. Puerto Ricans’ increasing numbers in Florida mean that they have started to close the gap with Cubans as the state’s biggest Hispanic-origin group. Florida’s Cuban population, at 1.4 million in 2014, has grown 65% since 2000, a more modest pace than that of the Puerto Rican population. Puerto Ricans leave in record numbers for mainland U.S.